In my ongoing series of hilarious single cover art forcing me to grind out a review, a slightly unexpected contender arose a few weeks ago. 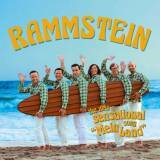 I mean, how do you not love the Rammstein-fellows going all Beach Boys with the surfboard and general goody-goody image. Now to just wait until they cover Fun, Fun, Fun. But if we're serious for a moment, this doozy seems to be a newly produced single coming from their recent best of-compilation, Made In Germany 1995-2011. You know, the mandatory New Tune-hook that is needed on those collection-albums to motivate the hardocore fans into buying dat stuff. Musically, we are not even close to the beachy vibes of the cover art. The titular tune starts off with some quirky yet catchy keyboards that sound like a middle-eastern tinged take on the game music from the Metroid-series or something similar. Pretty cool stuff actually. The signature crushing-guitar-wall stomp that Rammstein has made a killing with is in fine form and singer Till Lindemann bellows on top of the militant ordinance with gusto. I've always been a bit on the fence with Rammstein, not really following them with enthusiasm at any point but liking certain tunes. With that background, this is actually one of the best tunes I've heard from the band along with Mutter and Links, 2, 3, 4. Groovy and catchy all the way. The single also contains two interesting remixes of Mein Land, one by German country/punk-cover band The BossHoss (remixing this into an acoustic campfire country tune that is actually the song translated fully into English - surprisingly acceptable and hilariously redneckish) and Scottish post-rock band Mogwai (a very computer-driven take on the song with electronic atmospherics and loopy beats covering the song in a spacey wash while Lindemann's sporadic vocal bits hover on top - not great as I'm allergic to anything resembling techno - although I must admit that if this tune played in the background during some covert, bleak mission in the Command & Conquer: Red Alert PC-game, I think it'd suit the mood pretty damn well. So overall, I expected almost nothing in particular from this release beyond the cooky cover art but found a very versatile single that could even bring new fans to the band while bringing quality. Being a person who usually vomits through the ears at the mere mention of "remixes", this short set from Rammstein was certainly a pleasant surprise.